Back in the 70's there was a bread strike and bread was in short supply. I was on a PMT bus once and there was some bread being delivered to a shop. The bus spotted it, stopped his bus and ran over to get some bread. Everybody had to try and make their own bread. My mum would put the bowl in front of the fire with a damp tea towel over it. She would let it rise and you have that lovely smell of bread all over the house. She made some lovely bread. She had a go at brown once and that didn't quite turn out right. I remember taking sandwiches to school made out of it. They were like bricks, in a strange kind of way I enjoyed it. I prefer artisan bread, it's much better than the white sliced you have to put up with most of the time. When I was 5 or 6 my dad use to make bread. Because it was an old fashioned house it had a coal fire. He had to keep the temperature in the kitchen at a set level and it had to be really really warm. We weren't allowed in the kitchen and if anyone opened the door, even for a second, he would yell at us. At the end there would be mountains and mountains of these little bread cakes. It was worth it afterwards but I hated it while he was doing it. Mow Cop - Wayside Ovens. During the last 200 years, wayside ovens were a public service facility in many villages. They were usually built as simple structures within easy reach if groups of dwellings which would not have had ovens, relying on open fire cooking. Wayside ovens could be used to bake bread on a daily basis. They were fired up with wood and heated for an hour or more to warm them up to baking temperature. The embers would be scraped out and the risen bread dough would be placed in the oven to bake. A door plate would be closed and sealed with clay during the cooking to conserve the heat. This was an all-weather, all year round task. The Primitive Wesleyan Chapel was refurbished late last century and the bread oven was completely demolished. The stone has been disposed of and the wall and tarmac surfaces re-built. 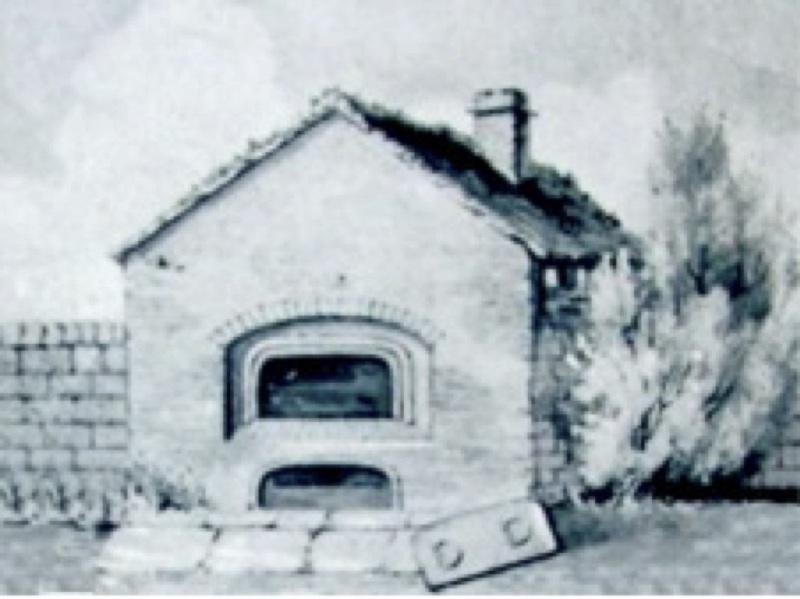 The only evidence of the nature of this oven comes from a washed sketch in Harpers original text. The size of the oven suggests that a single bake would produce perhaps 20 round loaves or 30 tin baked loaves. This would have been an ample size for the surrounding households at the time. I other documents, a supposedly different wayside oven was recorded on an alleyway adjacent to Westfield Road, which is itself more of a farm track at the back of a run of terraced houses. This record is actually the same oven that was at the back of the Wesleyan Chapel as the pathway runs along the front of the same terraced houses. The new build of the Mow Cop Primitive Methodist Church on Bank was in 1903 and the wayside oven was there at that time. It may well have pre-dated the church construction, but there is no discernable documentation at present. It is clear that the oven was not used in living memory and I have been unable to find any photographic evidence. John Holland is a local man whose family has lived in Mow Cop for generations. Now living at the end of Westfield Road, he has a good recollection of local knowledge and he does not remember the oven in use. He does know that Well Street, nearby, is locally known as Bakehus Lane (Bakehouse Lane), as the old cottage halfway up the lane had a bake house built onto the side. The locals would go and buy or bake bread there. Known in the past as Lovatts Bakehouse, it may well have been supported by Joseph Lovatt, the baker from Rookery near the bottom of the Hill upon which Mow Cop stands. The house is now a private home and there is no evidence of an oven. Like many of the properties in Mow Cop, it has been extensively refurbished in modern times. Prior to the Second World War, most of the flour to make bread was imported from Canada and the United States. At the outbreak of war, shipping was a prime target and food supplies became scarce as a result of enemy action. The Ministry of Food introduced rationing and food production strategies in the UK to try and cope with the shortages. Grains used – Common Wheat, Canadian Wheat, Spelt Wheat, Barley and Oats. Flour types – Wholemeal flour, Barley Flour, Oatmeal Flour. Many houses in the 1930’s and 40’s had cooking ranges and Yorkist fireplaces with built in ovens which were fuelled with wood or coal. Electric and gas cookers with ovens were also in use, so essentially most households were able to bake bread to supplement the rations. By 1942 most foods were strictly rationed, including bread and flour. The only exception was fresh vegetables and fruit which were not rationed, but in short supply. The ministry of food commissioned texts to instruct people how to make the most of their rations. This included the National Loaf, devised by Doris Grant, one of the government food nutritionists. This became known as the Grant Loaf and was a quick and easy bread to make which could be baked in any form in any oven with almost any wholemeal flour. Other bread was available, but bakers were challenged to obtain enough ingredients to produce specialist breads other than wholemeal loaves or rolls. Potato bread and barley bread were often made when flour was scarce. Wholemeal bread – Loaves and rolls made from available wholemeal flour. National loaf – Home made to Doris Grant’s recipe, often with local variations to add flavour. White Bread – This was occasionally available when sifted flour was available. Mainly in the South of England. We use to have a man who came round and delivered bread, he had a van I think. His name was Alex. I was 8 years old and lived in Blurton. We had his bread every day. My mum and dad would buy bread from the local shop when I was 4. That's the first time I can remember eating bread. I made bread at high school with Mrs Cuts, I'm a bit of a martial arts fan so I knocked hell out of it in the kneading process and I did well as it was an exam. We always have pizza on a Saturday night and about 15 years ago I decided to try and make them myself. That got me making bread dough, so a couple of years ago I started making my own bread. i enjoy making it, it's such a lovely thing to do. I tend to make simple bread and rolls. I find it's quite therapeutic, when you've had a hard day you can work out your stresses on a piece of bread, it's fantastic.